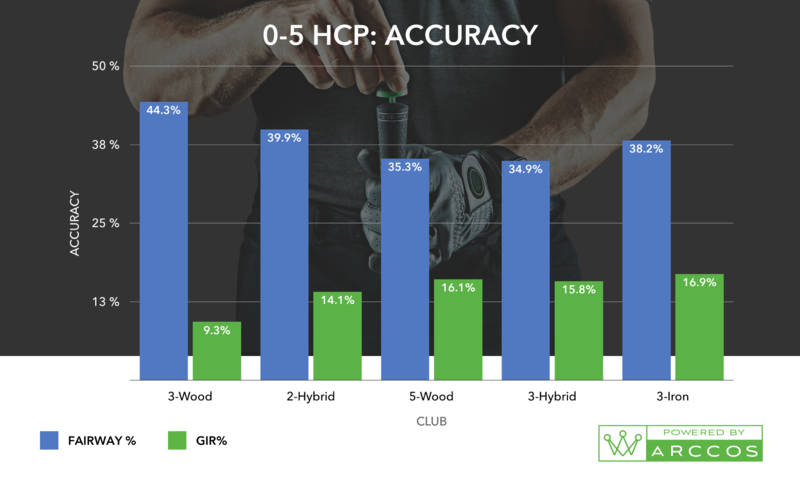 Woods, Hybrids and Long Irons – What Combination Is Best For You? Bag makeup is personal – there are no rules that say you have to carry a certain combination of clubs. The selection of 14 clubs is one of the few things over which golfers actually have total control. So how can amateur players make the most informed decisions? 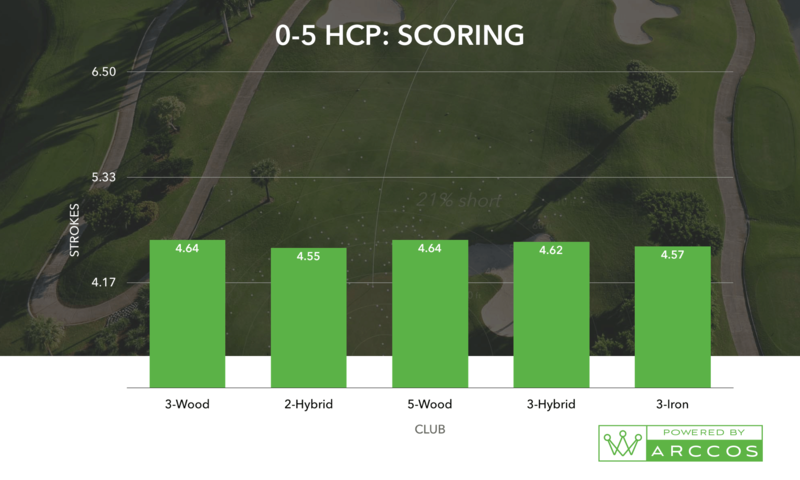 Our last data collaboration with Arccos pitted the 4-iron against the 4-hybrid. 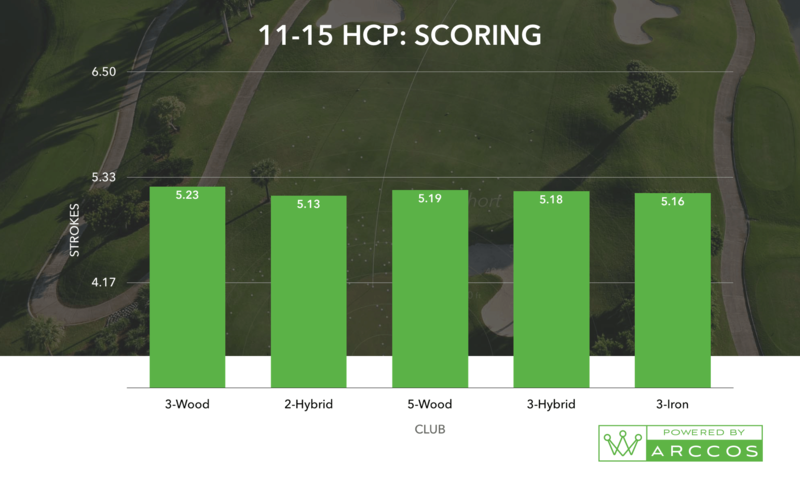 Using the Arccos database of 100+ million shots taken during 1.6+ million rounds, we expanded our analysis to include all long clubs: 3-wood, 5-wood, 2-hybrid, 3-hybrid, and 3-iron. The information below is grouped by handicap bracket. 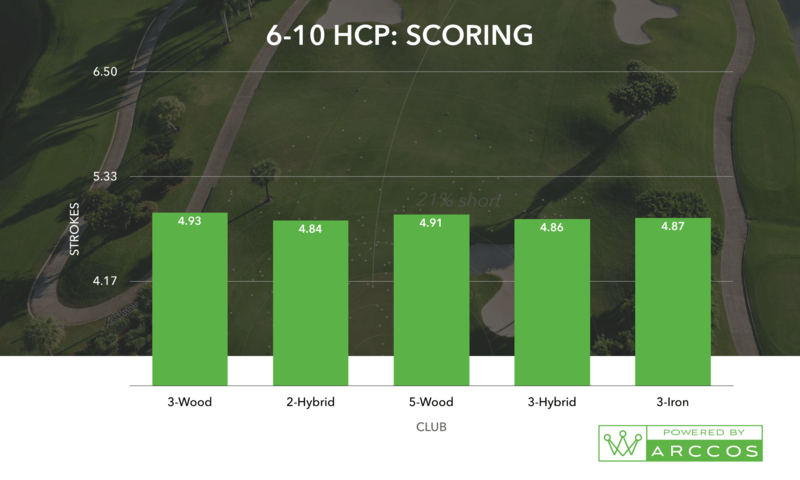 In each section, you’ll see how each club performs on average in five categories for golfers of different skill sets: drive shot distance, approach shot distance, fairway hit percentage, greens in regulation percentage and average score when using as tee club. 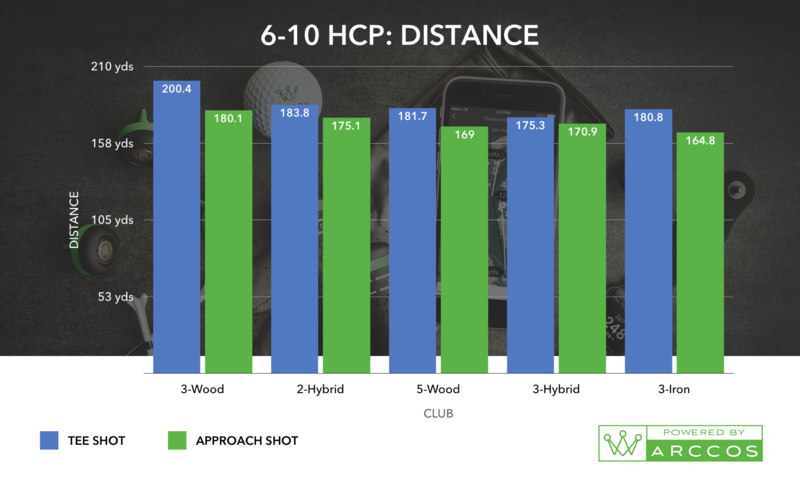 With clubs ranging from 3-wood to 3-iron, even the best players in our study have trouble achieving the same distance totals on approach shots compared to tee shots. There’s a large gap for all five clubs. 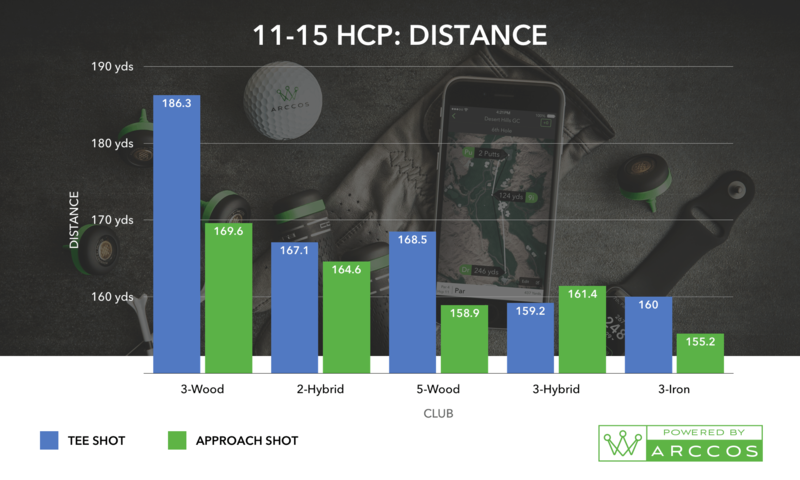 On approach shots, the 5-wood, 3-hybrid, and 3-iron all travel almost identical distances (~175 yards) for the players in this group, but off the tee, the 3-iron has a distinct advantage among those three clubs. The data also shows an increase in fairway hit percentage with the 3-iron when compared to the 5-wood and 3-hybrid. (Yes, there are people out there that actually can find the sweet spot on a 3-iron!) If you’re one of these better players, consider dusting off the 3-iron and putting it in the bag. Players in the 6-10 handicap bracket show relatively minimal differences between tee and approach distances for both the 2 and 3-hybrids. Focusing on the 3-hybrid, it’s interesting that this club has the lowest fairway hit percentage for this group of players. Several comments in the 4-iron vs. 4-hybrid piece noted that as single-digit players, hybrids are often too easy to hook off the tee. That holds true here as the 3-hybrid sits five percentage points behind the 3-iron for fairways hit. 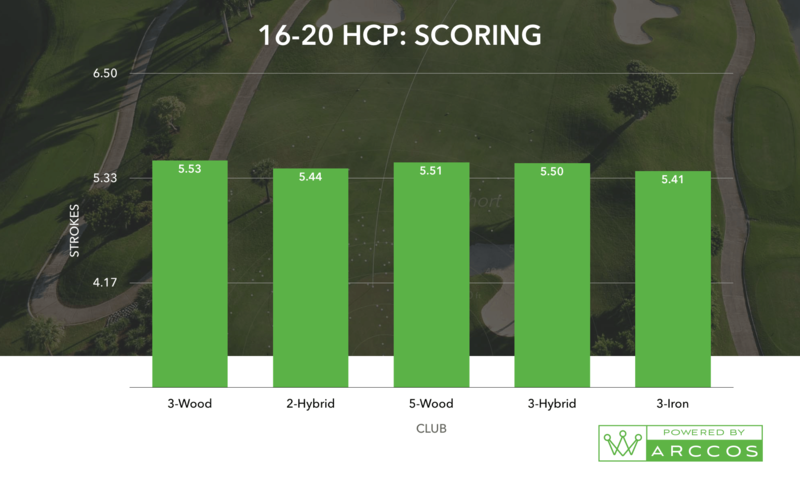 This group features players who most likely are trying to break 80 more often – being smart about hybrid usage could make that goal a reality. As with our previous group, this group also hits hybrids close to the same distance off the tee and on approach shots. For both the 2 and 3-hybrids, distance differences are only about three yards between tee shot and approach shots. The most significant gap between tee shots and approach shots is found with the 3-wood, while, not surprisingly, the 3-iron is the shortest club for approach shots overall. Armed with this knowledge, golfers in this handicap bracket can focus on improving these shots during practice sessions or avoid them on the course. 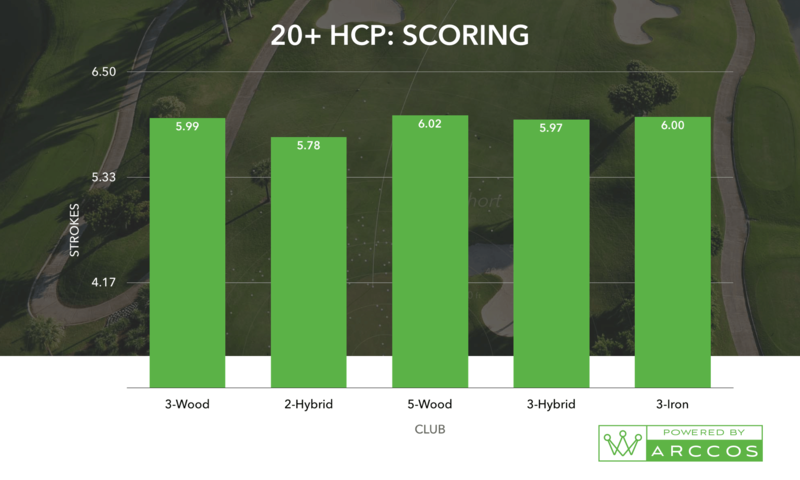 Overall, when you factor in distance and accuracy, the 2-hybrid is a solid play for this group. It has a steady fairway hit percentage combined with consistent distances off the tee and on approaches, with the added kicker of the lowest average score when used as a tee club. For the first time, this group sees several clubs with longer distances on approach shots compared to tee shots. The 2-hybrid and 3-hybrid gain five and six yards, respectively, on approaches. In general, the 2-hybrid through 3-iron clubs perform very similarly. For the most part, they are only separated by a few yards off the tee and a few percentage points for fairway percentage. 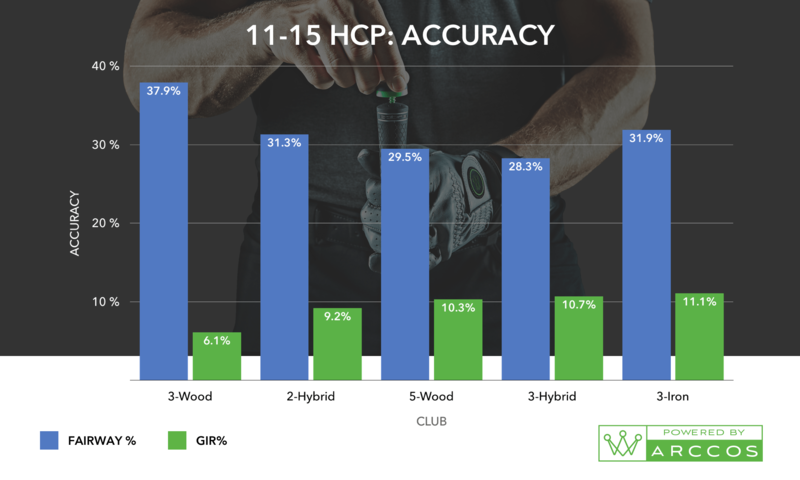 This runs counter-intuitive to the thought that higher handicap players should ditch the 3-wood in favor of hybrids. As a fairway finder, the 3-wood is the clear champ. 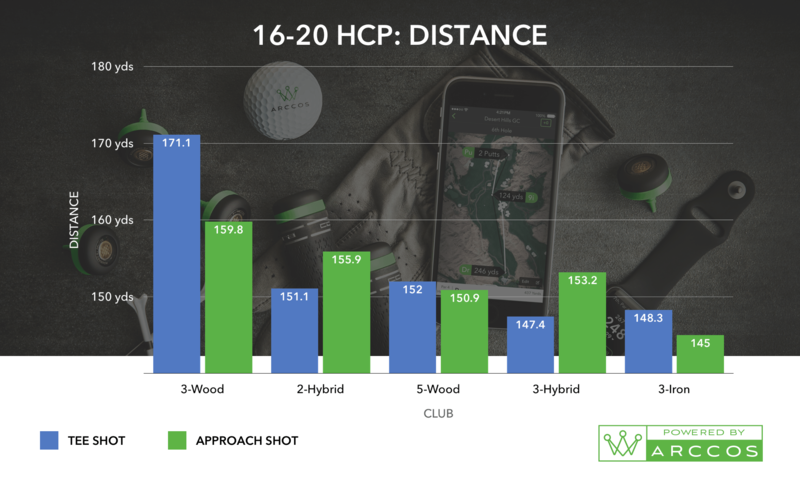 For these players, the 2-hybrid and 3-hybrid gain about 5 and 9 yards on approaches compared with shots taken off the tee. 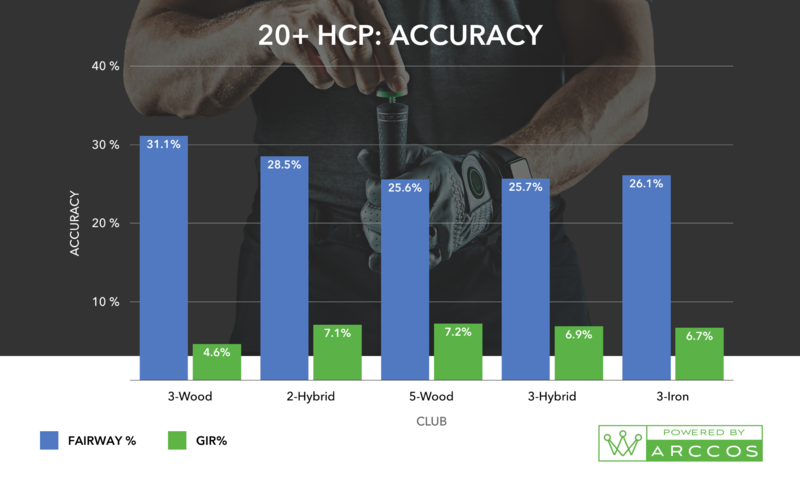 For every other handicap bracket, the 3-wood is the clear winner in fairway hit percentage, but in the 20+ bracket, the 2-hybrid is close to surpassing the 3-wood. It only falls about 2.5% behind. For approach shots, the 2-hybrid travels one yard farther and hits the green about 2.5% more often. Finding the right bag makeup for your game is simple: The more you play with Arccos, the more data you have at your disposal, the more informed decisions you can make. The answer, as always, lies in the data. This doesn’t appear to take lie into consideration. It may very well be that the 3 iron worked better than a hybrid because the lie and the shot angle were very inviting and allowed for a 3 iron. Conversely, it may be that the hybrids were used when the lie was terrible, which would skew the results (at least for GIR stats). As a “Golf Statistic Tracker” user (albeit not Arccos), be warned, that all shots are not treated equal. Shot Tracking products do not take into consideration wind, nor elevation changes. With that in mind, I make my club selections based on distances obtained in a simulator with the wind turned off. I use a Touredge HL3 #2 Ironwood off the tee on tight fairways and I can hit it as long as any of the 3 woods I own (all shortened 1″ and re-swingweighted accordingly). I can hit this TE HL3 #2 straight as an arrow, never failing to find the center of the fairway or the par 3 greens. I don’t use it for approach shots as I have a Big Bertha Fusion 7 Wood (-1″) that can get me the rest of the way to the cup. Interesting. I’m in the first group. I own a 3w, 5w, 3h, and a 3i. Admittedly, the 3i is a graphite shafted Hybrid style but it’s tagged in Arccos as 3i. I use all of these clubs frequently and for very different purposes. They have very different ball flights and very different carry/roll distances. Rarely would more than two be in my bag at any given time. Data without context isn’t very helpful. Great article! This clearly demonstrates knowing what clubs, distances and club accuracy you need to have in your bag. Fairway woods , hybrids or long irons , what works best for your game. Ok so tracking shots thru Arrcos or old fashioned pencil and pad (now very accurate when paired with a range finder) we can/should know which clubs to put in our bags. I have worked very hard on this for years and finally looked at my irons gapping of 4 degrees and continued that theme above and below the irons. My gaps are about 12 yards and I can choke down one wrap on my Winn Dri Tec wraps grips and trim 6 yards. I play the 3 and 4 hybrids because I find my miss hits go much longer than if I hit a 3 or 4 iron off the toe. I love my KZG irons but they are not very forgiving on mishits. I carry a 16.5 degree wood but that is the only club not at 4 degrees and I am shopping for a 15 degree three wood to fill that spot. Knowing how farr I hit each club is the key to my game, I may be left or right but I will be pin high most of the time. That is so empowering over the ball and creates a much more relaxed stroke. 1. Players are using the 3 wood more on longer holes and less on shorter holes. 2. The shorter holes tend to have tighter fairways (leading to more missed fairways with shorter tee clubs), but the misses with shorter tee clubs are staying in play, leading to legitimate approach shots. The fairways hit number is interesting, but I’d be really interested to see the side-to-side dispersion number. For the record, Arccos says I hit the fairway 49.1% of the time with a 3 wood and 58.8% of the time with a 4 iron (I don’t carry a 3 iron). And the 3 wood is 31 yards longer comparing Smart Distance for both. My 3 hybrid only hits the fairway 40% of the time and is 10 yards longer than the 4 iron. I’ve basically given up on it. Firstly, there are many 20+ handicappers who can hit the ball as far or further than the “average” 0-5 handicapper shown in this analysis. 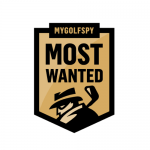 Some of those high handicappers can also hit their 3 iron much better than a 5 wood or hybrid, and some can hit a hybrid further and more accurate than a 5 wood or iron. Secondly, there are many 0-5 handicappers who hit it the distances shown for 20+ handicappers, but are consistent, dead accurate and have excellent short games. These players are generally experienced, but older players, women or juniors.. Although these players may be able to hit a 3 iron just fine, they can’t afford to give up any distance so may use a 5 wood or 3 wood most of the time for those shots. That is the general problem with aggregating data, it can often make the analysis of that data quite misleading. Perhaps if it were broken up not only into handicap, but age or gender it might be more relevant. As it is, this data merely catches the readers attention, but leaves them with nothing much substantial for their own game than the need for them to collect their own data on their golf game and make some rational decisions about the clubs they have in the bag. 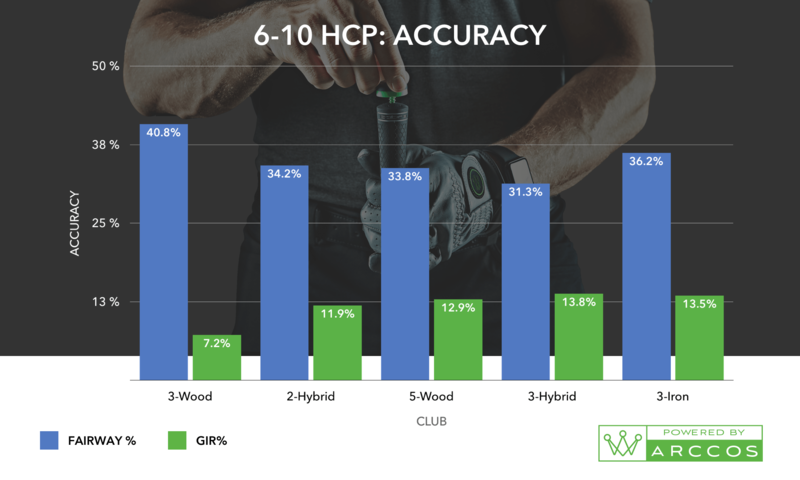 Folks, please don’t go and ditch your 5 wood in favour of a 2 hybrid or vice versa just based on the data in this article – you might find you can’t hit the 5 wood or 2 hybrid worth a darn if you do…but do collect your own data so you can make the right decisions. All the distances seem pretty short to me. In my experience penalty strokes and poor short games are what lead to high handicaps, much more so than the few times a round where one needs to hit a long iron or a similar club. I think the distances are spot on. 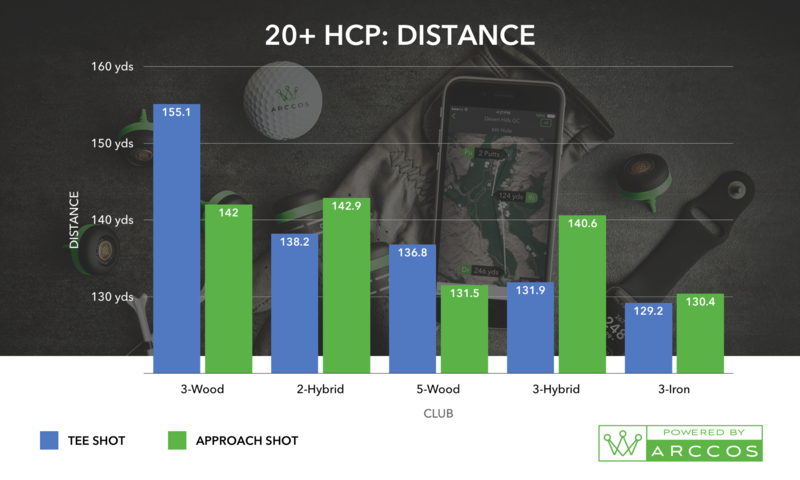 The distance is based on averages, which include good and bad shots. There’s no formula to remove outliners here, so the data is more real and truthful (which is the biggest arguement against launch monitor testing). I agree with Brad about some players being able to get more distance out of clubs than there handicap suggest. When you tack on the strokes gained system you can better evaluate your game. For example, let say you are that 20 handicaper that hits his 3w as far as a 0-5 handicap. Well if that is the case, you don’t need to practice with the 3w as much and you can better focus your practice on other areas. 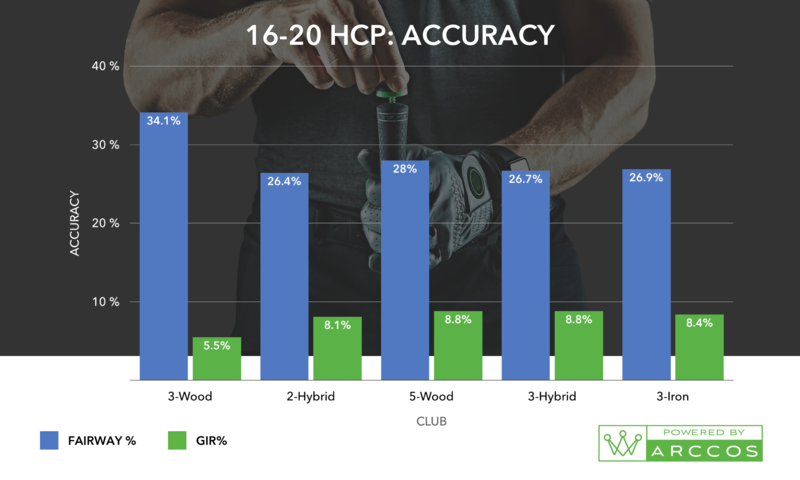 With your own data you can see where you stack up with your long clubs and see what is maybe a better fit. Ignore putting yourself into your actual handicap bracket, instead where does your data suggest your handicap is. That is really where the value is at in this article. If your data doesn’t match your actual handicap that means you are either better or worse than your handicap in that area of play, and you can use this to see where you are actually at. I think the distances are pretty spot on, and statistically they are. I’ve been teaching for 17 years and one thing I am sure of is the majority golfers drastically over estimate their distances. Interesting look at things. I play to a 3 handicap right now and just dumped my bladed 1-3-4 irons in favor of softer landing hybrids last winter. The 17° is amazing off the tee – the 20° is perfect from the fairway and the 23° looks nice in the bag next to them. I’m pretty well set from 225 in now and can take the 17° about 265 off the tee. Not a bad deal for me. I think the lesson here though is to do your homework before you buy anything that may help you game. Great write up! I think it would be interesting too for a breakdown of handicap, accuracy, distance and scoring for 3 wood vs 4 wood. I cannot truly understand the big argument over technology and how much it has helped golfers. According to this data, someone that typically scores in the low 90’s hits their 3 iron 129.2 yards? I play a lot, and I have never seen anyone that is consistently in the low 90s hit that short. Further, this means the average golfer would have only hit a 3 iron 110 yards before the advancement of technology? I know par 3’s have always been over 130 yards on average. Does this mean every 20 handicap golfer hit 3 wood or driver into par 3s? I’m sorry, but something doesn’t make sense…. I too was struck by this, but I’m assuming they did not filter out the duffs / mishits, etc. that could easily drag the average down significantly. As with most of these analyses, they raise as many questions as they answer. My hypothesis is that the full distribution for shots among high handicappers is pretty bi-modal with a mass of shots around 170 – 180 yards (good hits) and a mass of shots around 40 – 60 yards (duffs, shanks, etc). Depending on how those two shot clusters mix could easily give you a 130 yard average. Showing box plots, histograms, or densities of the shot data would answer this empirically, but that’s my .02. I think what doesn’t make sense is how you are trying to tie distance into things. I’m going to go on a limb and say that the distances you see are averages, not typicals, and it does include all bad shots. So based on that, yes I fully believe the average distance is accurate. The higher the handicap the more clear it is that there is a struggle with long clubs in general, not just irons. Now if you were to throw in typical yardage the picture would look different. I think Accros calculates typical yardage by taking the top and bottom 5% of the shots out of the equation, which should give you what you “should” expect to see. I use gamegolf, and the stats show the same thing. Every game I get an average distance and a typical distance. Last game my average driving distance was 232, with my shortest being 195. A week before that my average was 212 with my shortest being 150. However; my typical yards for both weeks stayed at 235. With that information I can tell I had a bad week of drives, and a really damn good week of drives. Going back to your point on distance, hopefully that clears up why the distance looks the way it does. Thanks for this. I found it rather interesting. It is if you aren’t hitting your driver correctly. The driver should be going further on carry and total distance. How does arcoss differentiate a lay up vs a deliberate attempt to hit the green? The GIR %’s above are only from shots were the player attempted to hit the green? The GIR % seems low for all categories, I record my stats manually on an old software program and my GIR %’s are better than the 0-5 handicap group, which surprises me because I always felt my GIR numbers to be poor. Bag make up is determined by swing speed (ball speed) plus player preference. Unfortunately it doesn’t. Same goes for punch shots used with the clubs and all that. So your 50 yard shot to get back into the fairway with the 3 iron or wood goes against your average club distance. If they’re using Arccos data, they *should* be using Smart Distance (which omits both long and short outliers) and not average distance. That should filter out the punch shots from trouble.